Secretary of State for the Department of International Trade, Dr. Liam Fox, joined Maritime UK aboard HMS Queen Elizabeth, for the inaugural ‘Maritime Nations Forum’ between the UK and US. 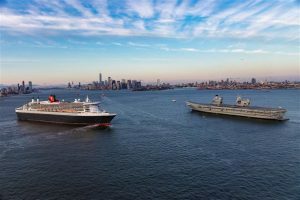 HMS Queen Elizabeth, the largest and most powerful vessel ever constructed for the Royal Navy, and RMS Queen Mary 2, the flagship of Cunard Line, are in New York harbour together. Delegation visits as US administration formally confirmed it intends to pursue a trade deal with the UK “as soon as it is ready” after leaving the EU. A delegation of business leaders from the UK maritime sector visited New York this week accompanied by the Secretary of State for the Department of International Trade, Dr. Liam Fox. The British maritime leaders met with an American delegation aboard the HMS Queen Elizabeth at the inaugural ‘Maritime Nations Forum’ between the UK and US. The US delegation featured major names from the New York maritime scene – lawyers, bankers, shipbrokers, insurers, technologists – and leaders from the wider United States. The maritime delegation arrived at a pivotal time in the negotiations on the UK’s departure from the UK. With the UK’s Department for International Trade consulting on a new free trade agreement with the US, the scope of that trade deal will depend on the terms deal agreed with the EU. The US administration formally confirmed it intends to pursue a trade deal with the UK “as soon as it is ready” after leaving the EU. Many of the companies on the UK delegation were involved in delivering the HMS Queen Elizabeth aircraft carrier, currently in the US for tests with the US F-35 fighter jet. Carnival Corporation and PLC, owner of Cunard’s RMS Queen Mary 2 is the only company in the world to be listed on both the S&P 500 and FTSE 100 indices. Both ships therefore symbolise the breadth and strength of the transatlantic relationship.